Christian Holliday wants it to be a crime to campaign for EU membership. A BRITISH POLITICIAN has suggested that when the UK leaves the EU people should be tried for treason for campaigning for a return. Conservative councillor Christian Holliday has launched a petition that he hopes will make it a crime to push for a EU membership. Holliday’s petition is published on the UK government’s website and will force the government into a response if it reaches 10,000 signatures. As of 12.15pm this afternoon it has almost 450. To conspire with foreign powers to make the UK, or part of the UK, become a member of the EU. Holliday’s suggestion comes as both sides of the post-Brexit debate clamour for greater clarity about what it will mean for the country. 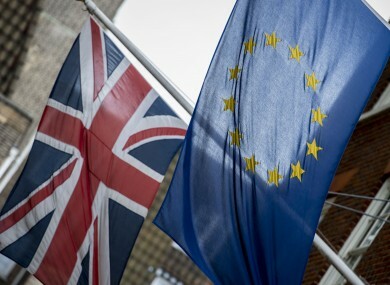 A case is currently being taken by Remain campaigners to ensure that the House of Commons will have to vote on the government’s decision to invoke Article 50 of the Lisbon treaty that triggers EU withdrawal. Some Leave campaigners and Brexit leaning publications have labelled people who are still campaigning against Brexit as ‘bremoaners’. It is within that backdrop that Holliday’s petition has been published and he makes reference to such opposition in providing details of his petition. “It is becoming clear that many politicians and others are unwilling to accept the democratic decision of the British people to leave the EU,” he says. Brexit must not be put at risk in the years and decades ahead. For this reason we the undersigned request that the Treason Felony Act be amended as set out in this petition. Holliday’s suggestions has been derided by some online for being undemocratic itself in wanting to imprison political opponents. Others have merely poked fun at the idea. We're all going on a Christian Holliday! Straight to jail for a year or 2. Cos we talk about the EU. The Guardian has also pointed out that he idea would likely be ineffective in any case because the 1848 act he is seeking to amend hasn’t actually been used in a prosecution since 1879. TheJournal.ie has attempted to reach Holliday to further explain his reasoning behind the petition. Email “Pro-EU activists should be convicted of 'treason', says Tory politician ”. Feedback on “Pro-EU activists should be convicted of 'treason', says Tory politician ”.